Pioneer fruit cake without alcohol from Sweden and Wales. 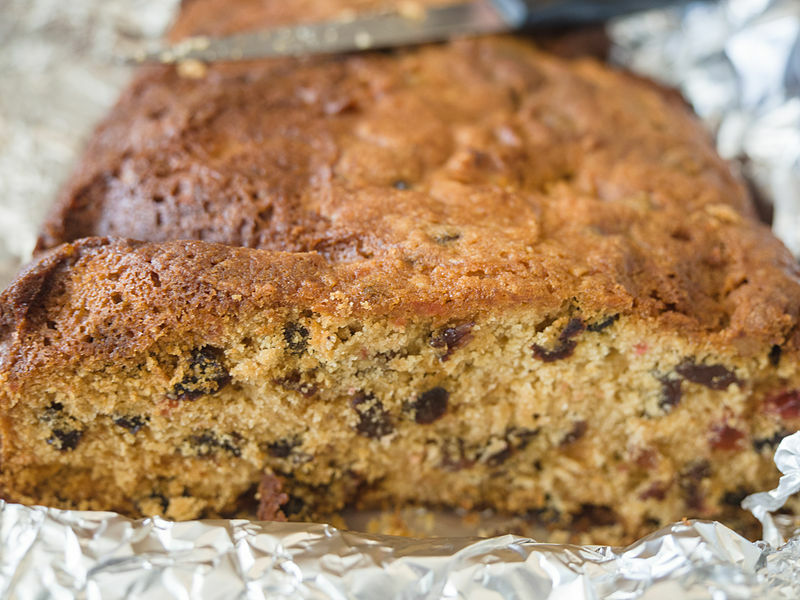 Fruit cake without alcohol: This formula for fruitcake has been handed down from Sweden and Wales. There have been many variations of it. It does not use alcohol as their religion did not accept the use of alcohol. The difference was that you first cooked the raisins in the cinnamon and water. Read through the instructions first!Boil sugar, shortening, water [reserve ¼ cup], raisins and currants with cinnamon and other spices that are available. Boil for 3 minutes. Set aside to cool.In a separate bowl combine flour, baking soda, baking powder and salt. No need to sift. When the wet ingredients are cooled, can be warm or room temperature, not hot as the soda will 'cook', you can add the flour mix. Take the reserved water to 'wash out' the pan with to get all the cinnamon/spices and add to the mix. Add flour mixture to the wet ingredients one cup at a time. Make sure it is thoroughly incorporated. You will see the mix foam up some. Lastly add the chopped nuts, and glazed fruit. Mix well. The dough will be very stiff. Place in the greased pans and bake. Bake in separate containers such as small loaf pans, pie tins, baby loaf pans or muffin tins. Fill each container half to ⅔ full. It will not raise up much. You still have to bake it at least 30 to 40 minutes. A full bread loaf pan takes an hour to cook as it is too deep. It is better to cook it in smaller portions. It still stays very moist and not dry. Test with a toothpick after 30 minutes. Bake 350 degrees F.
More information: As the people were able to get more ingredients they were added to the mix. But the basic is good enough. It is moist and flavorful. You do not need to add any alcohol. Any kind of sugar works fine in any combination. Stevia, or artificial sweetener does NOT work. Honey used sparingly, like ¼ of a cup of the 2 cups total of sugars is fine. You can make brown sugar out of white sugar with a small amount of molasses. Not too much! The additions were homemade glazed or candied fruit that was cut up rinds of oranges, lemons and dried fruit such as cherries. All cooked with a lot of sugar and dried. Candied fruit is easily available today. You can add 1 to 2 cups of the glazed fruit – reserving some for the top. Next added over the years was one or two eggs. You do not have to decrease your water. You can use any kind of combination of fruit juice and water and applesauce for the liquid as long as it measures 2 cups or 16 ounces. You can add any kind of chopped nuts. You can reserve some whole nuts for the top. If currents are not available you can use all raisins. I usually use a 2 cup combination of golden raisins, regular raisins and currants. I have even used dried cherries or dried craisins. It is all very good. My mom found that if she carefully wrapped each loaf in plastic wrap and then aluminum foil the fruitcakes froze very well. She would defrost the cakesfor a day and then add a buttercream frosting. I prefer a cream cheese frosting made with very little powdered sugar. One year during World War II Grandma Ethel told me she did not have the money for nuts. So she carefully chopped potatoes in tiny pieces, [some Russets probably as they were living in Utah and Idaho], and added those raw to the mix. No one knew – she said it was fine. I have not made this fruit cake since I stopped cooking a few years ago but I used to make this every year for a good 20 years. 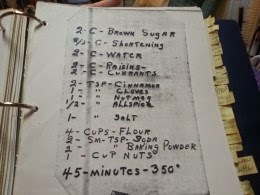 This recipe was a family favorite and I had made many variations. It all started with my Swedish Great Grandmother who passed along the recipe now going on 6 generations with my daughter. The difference here is that you cook the raisins with the sugar or honey and applesauce to incorporate the cinnamon. It all makes it very moist so you do not have to use alcohol. 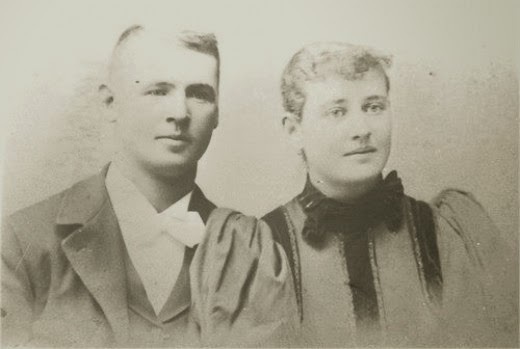 The pioneer ancestors from Wales adapted a formula along the trail that was made with very little of this formula. Basically flour, sugar or honey, raisins, some lard, salt, cinnamon, a leavening depending upon the availability of it and water. This high caloric bread was stored well dried out and thus the practice to soak it in alcohol to rehydrate it. The ancestors who eschewed alcohol would soak the fruit bread in water or milk. Today’s version is more of a desert than a pioneer trail emergency energy food.